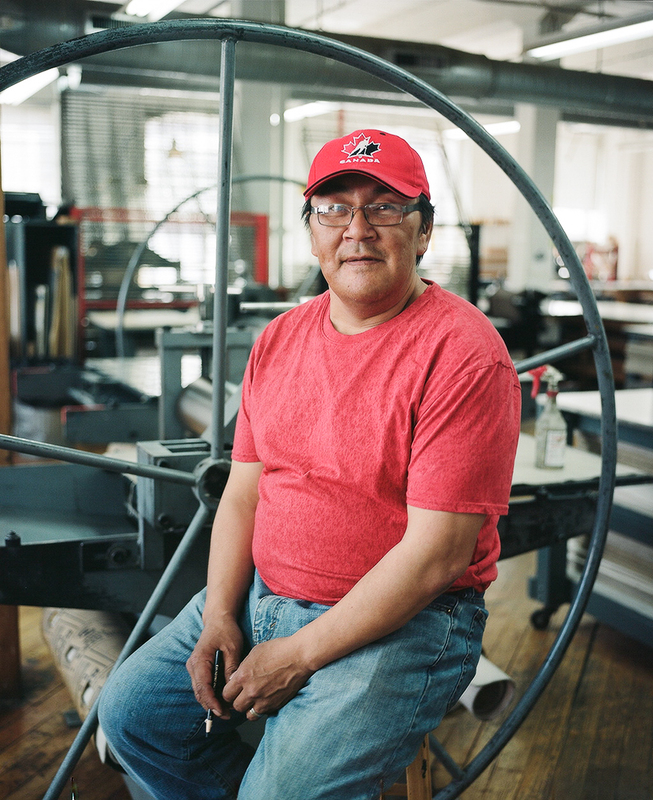 This spring, Dorset Fine Arts and Open Studio hosted a two-week creative residency with Cape Dorset Inuit artist Tim Pitsiulak. 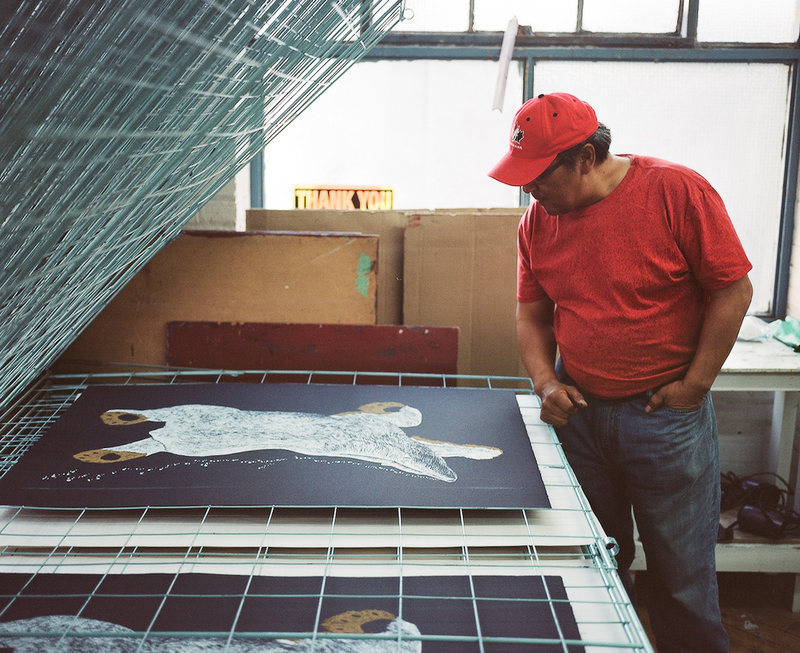 Working in collaboration with lead printmakers, Pitsiulak created editions based on two of his iconic Arctic wildlife drawings. 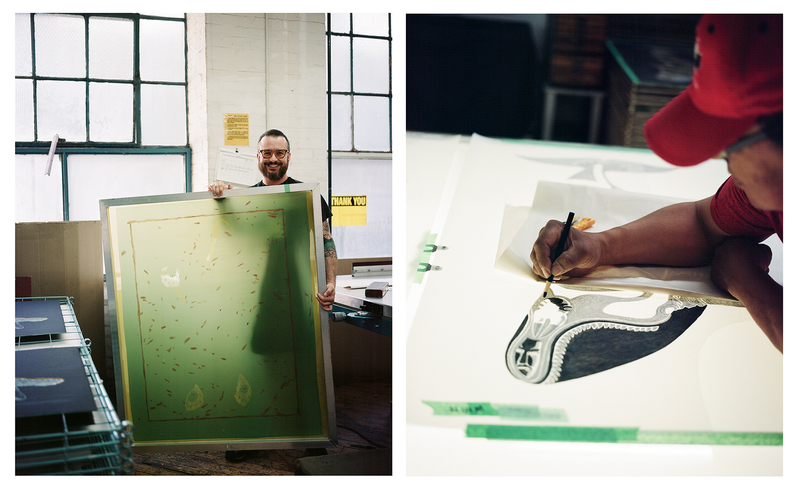 William Huffman sat down with the artist, Dorset Fine’s Arts works-on-paper specialist Kate Vasyliw and Open Studio’s creative team Anna Gaby-Trotz and Nick Shick to talk all things print—and find out just how this artful partnership shook down. 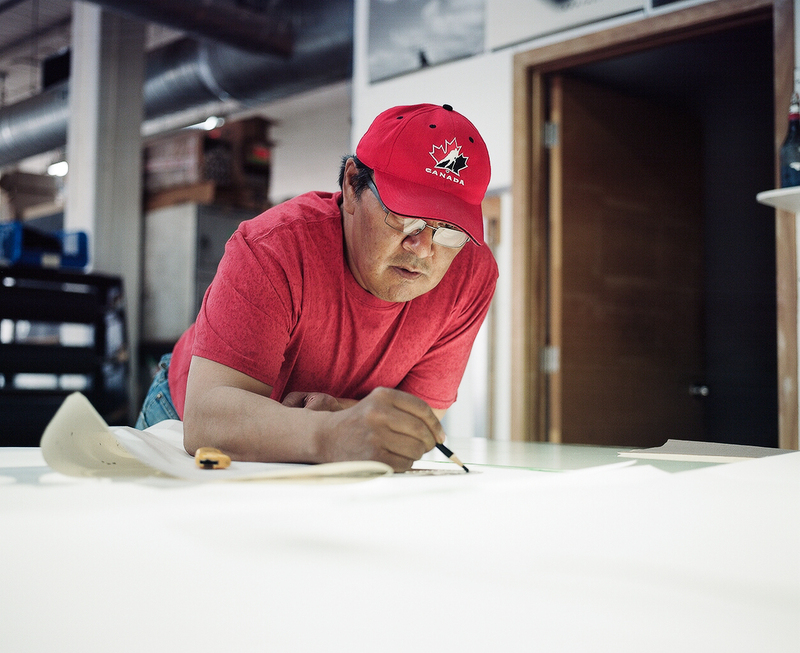 William Huffman: This is the first time that Open Studio has hosted an Inuit artist in a residency program. Can you tell us about the experience and anything that you might have learned over this two-week relationship with Tim Pitsiulak? Anna Gaby-Trotz: Tim has an amazing commitment to his art form and a strong dedication to the places that his art comes from. It was such an education to hear stories about the environment in which he lives and how that relationship to the land directly informs his work. That was definitely a brand new experience for us at Open Studio. And just to underscore that commitment I mentioned earlier—within just a couple of weeks’ time, Tim was able to make two new drawings and, with the assistance of Nick, create screen prints of those drawings. 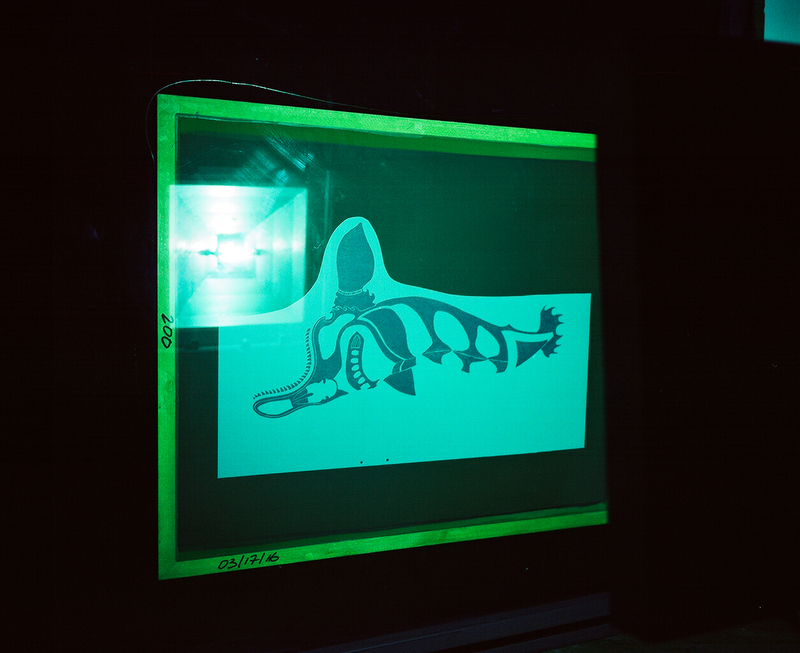 His approach to the working process is very unique–when he came into the studio he just began to create, there were no preparatory drawings and he definitely doesn’t use a sketch book. He simply begins drawing. There’s not one pencil mark out of place, even on the black paper that he used, he didn’t ask for one extra sheet, he just committed to making that work. I’ve never seen something like that before, and that’s been very, very inspiring. I’d also say that Tim’s strength and humility in the studio is something special. One thing he told me is that he’s always learning—always learning everywhere that he goes. That’s something at Open Studio that we can understand. We’re always learning too—from each other, in a very community-based space. Tim quickly became a vital part of that knowledge exchange between artists, between printers, between friends. Tim created a special energy in the studio just by being there. 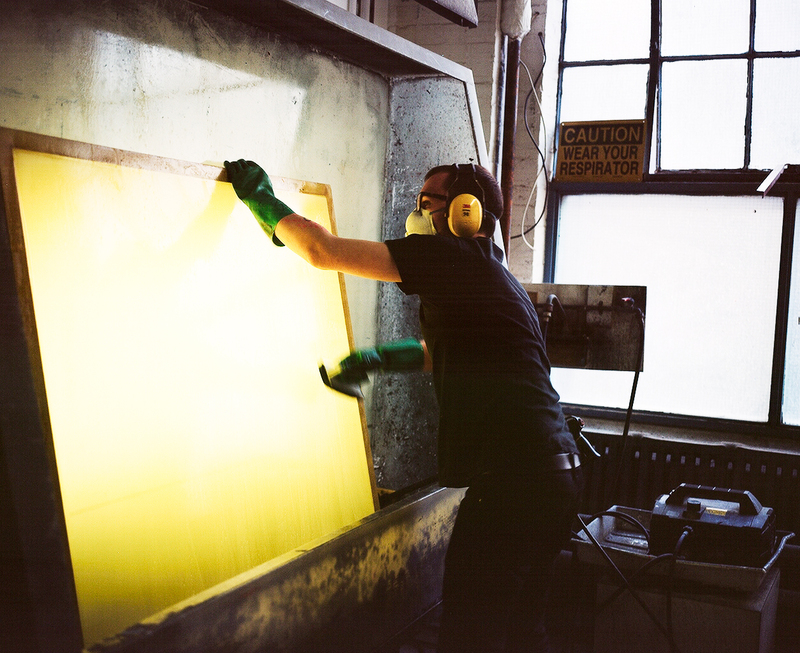 Nick, you’re the lead screen printer here at Open Studio and you’ve worked collaboratively with lots of other artists. Based on those previous experiences, can you tell me how similar or different working with Tim has been? Nick Shick: Each of the projects I work on is a new and exciting set of circumstances. Often the challenge can be time and resources but this undertaking has been unique in terms of the amount of support that we’ve had from Open Studio and Dorset Fine Arts. We’ve had the fortune of working with an extended schedule and we’ve been working together almost every day for two weeks—I think maybe we took Sundays off. With that ample timeframe we’ve had lots of opportunity for testing, revision and the ability to really get it right. 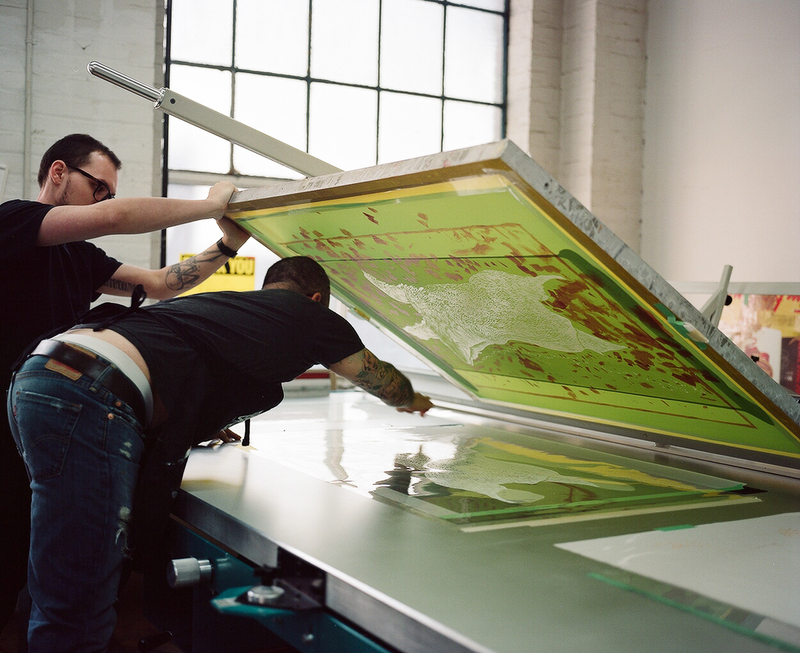 It’s fortunate that Tim has had previous experience with other print media so that was a great asset in him understanding the screen printing process. Experiencing how that existing knowledge would transfer to a new set of technical parameters was particularly interesting. Also unique to this project was that there was no digital component whatsoever. I have a lot of skills and background working with digital imagery, but I was very excited to have an opportunity to work on something that hasn’t touched a computer. There are no pixels anywhere, no digital artifice involved, everything you see is done by hand—which meant of course, we had a few challenges along the way. But this has certainly been a great learning experience for me, just being around Tim. As Anna mentioned, Tim’s commitment and extreme level of talent and skill, along with his work ethic, is astonishing. Every art student should work with an artist like this—someone who comes into work, puts in his time, works hard and you can see the resulting level of achievement. But aside from that, we’ve really gotten to know each other and became really comfortable around one another. As a result, one of the most unique aspects of this project is that I’ve experienced the most teasing ever! In addition to a lot of hard work, we also had a lot of fun together and I’m really proud of what we’ve created and very thankful to have had this opportunity. Kate, you’re the works-on-paper specialist at Dorset Fine Arts and you have lots of experience with the Inuit art market. How does this kind of a program help with what you do? Kate Vasyliw: This amazing initiative certainly opens up new opportunities for other Cape Dorset artists by allowing them to explore new printmaking techniques—traditionally stone cuts, etchings and lithography are the approaches taken up there in the North. This is really an exciting opportunity for our artists to think more broadly about how their work can translate into print media. At Dorset Fine Arts, we are very excited about the opportunity to collaborate with Open Studio, which is Canada’s premiere printmaking centre. It seemed so logical for us to reinvest in the relationship between Kinngait Studios in Cape Dorset and Open Studio here in Toronto—that sharing of knowledge and of expertise will be a vital part of seeding growth for both organizations. In terms of this project, I’ve been watching developments over the past couple of weeks, and seen how everyone had been working so closely and how hard Tim’s been working. It’s been an amazing process to watch. I know that it’s been a valuable experience for Tim and I’m sure it will be a great experience for other future artists too. 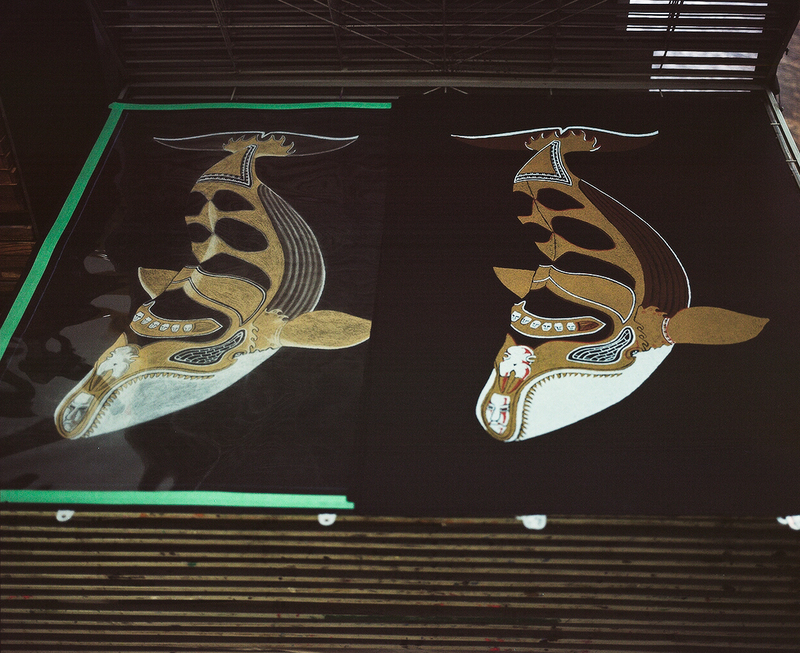 I think that the two prints that will emerge from this project are going to be a wonderful addition to the long history of Cape Dorset prints and hopefully open new markets and pique the interest of new collectors. Tim, as the first participating artist in this residency program, can you tell me a little bit more about your experience working with the Open Studio team? And what you might tell the Kinngait artists, about this experience, when you get back home? Tim Pitsiulak: Toronto is warm! I’ve been telling everyone that this is an early summer for me—my summer getaway. While I’ve been here I’ve seen lots of familiar faces which is one of the things that keeps me coming back to Toronto! But I’ve also been motivated by the new people that I’ve met as part of this experience—like the guys here at Open Studio. When I get back home I’ll have some great stories to tell. But when people ask me what I did that made my stay worthwhile, I’ll tell them that I went to my first IMAX theatre with 3D glasses. We don’t have theatres in Cape Dorset so I wanted to see Batman vs. Superman—I’ll say it was great, but I won’t give anything away, you’ll have to go see it. Seriously though, staying here for the two weeks working on my drawings and learning screen printing let me get to know the printmakers and artists here at Open Studio. We did a lot of learning and working and laughing together—and I got to do a lot of Facebook too. I don’t do Facebook when I’m home, it just takes my time away! I’m a hunter and an artist I don’t want anything else to distract me. I had so much work to do here and I got so much out of it—once I get back home I can tell the other artists about my experience screen printing. 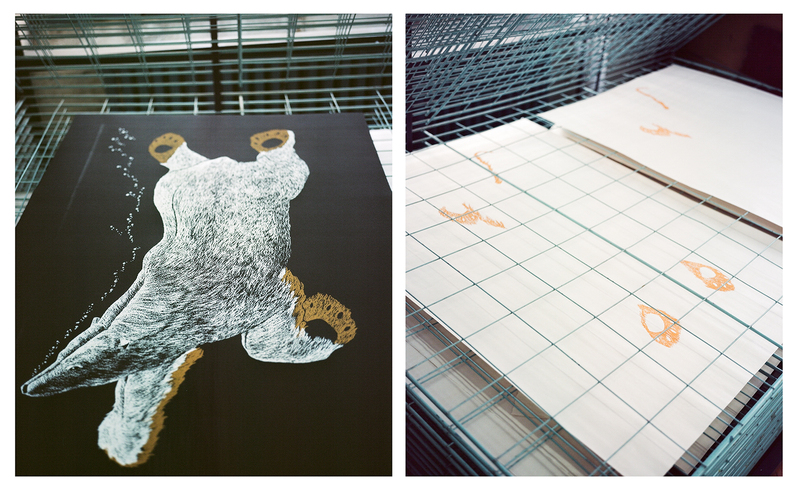 I want to try screen printing again and it’s something that we need to make happen more at the studios in Dorset. William Huffman is an arts administrator, curator, educator, and writer with a history of extensive involvement on both local and international cultural fronts. Follow @williamhuffman on Twitter.